ADL and Rep. Ackerman call Netanyahu's Settlement freeze - "courageous and unprecedented". The Anti-Defamation League (ADL) today called the announcement by Israeli Prime Minister Benjamin Netanyahu that Israel would freeze West Bank settlement building for 10 months a “courageous and unprecedented” tangible expression of Israel’s deep desire for a peaceful settlement of the conflict. Israeli Prime Minister Benjamin Netanyahu took a courageous and unprecedented step in announcing a 10-month freeze on building in West Bank settlements in order to spur peace negotiations with the Palestinians. We join with Israel and the United States in calling on the leadership of the Palestinian Authority and the Arab world to respond meaningfully to this significant step by Israel, and take their own meaningful action to promote reconciliation, peace and security with Israel. “Today’s announcement is a very significant achievement for the Obama Administration and very clear demonstration of Prime Minister Netanyahu’s readiness to make hard decisions in order to achieve peace. The temporary restrictions that Israel is adopting—purely as a matter of good faith—should be recognized by Palestinian leaders as an opportunity to reengage with the Israeli government in negotiations on an agreement that will finally put the conflict between Israelis and Palestinians to rest. I hope the Palestinian leadership and Israel’s Arab neighbors seize this opportunity. I fear, given past patterns and practices, that they will be tempted to again make the perfect the enemy of the good, and in doing so, diminish the hope on all sides that peace is possible. What Prime Minister Netanyahu has committed to is highly significant and instead of responding with complaints, this courageous step should be cause for positive acknowledgement and for rededication to moving the peace process forward. These just announced steps are a very important demonstration of Prime Minister Netanyahu’s commitment to work for peace and to make sacrifices, including political sacrifices for peace. His decision—especially given the scant credit I expect he will receive from some parties in the region—is especially bold, and I congratulate him for it. What is needed is for the Prime Minister’s courage to be matched by a willingness among all the parties to move ahead to negotiate the most difficult and challenging issues that stand in the way of a final peace agreement. (JPOST).After a virus forced Binyamin Netanyahu to cancel his trip to Berlin, the prime minister spoke on the phone Monday evening with German Chancellor Angela Merkel. The Prime Minister's Office said that in the "warm and friendly" conversation, the two agreed to try and rearrange the trip for mid-January. The PMO added that the two discussed issues currently on the "diplomatic agenda." Earlier Monday, following a second examination, the prime minister's physician, Dr. Tzvi Herman Berkowitz, confirmed that Netanyahu was suffering from a mild seasonal illness, and that rest and basic treatment should alleviate the prime minister's condition. Dr. Berkowitz anticipated that Netanyahu would be able to return to work on Tuesday. (Ottawacitizen).Palestinian Authority leader Mahmoud Abbas has recently threatened to resign over his alleged frustration that there was no progress happening on the Israel-Palestinian dispute. However, Middle East expert Barry Rubin argues the PA's actual goal is not peace, but Israel's elimination. Palestinian Authority leader Mahmoud Abbas has recently threatened to resign over his alleged frustration that there was no progress happening on the Israel-Palestinian dispute. However, Middle East expert Barry Rubin argues the PA's actual goal is not peace, but Israel's elimination. Once again we've seen a flurry of pseudo-events in the Middle East provoking much excitement and attention, despite having no real effect and significance. In this case, these include: the threat of Palestinian Authority (PA) leader Mahmoud Abbas to resign, his claim he would call new elections, and the PA saying it would issue a unilateral declaration of independence (UDI). These words were taken seriously and as a cry for help out of profound frustration that there was no huge progress or solution happening on the Israel-Palestinian dispute. Of course, Abbas never had any intention of resigning or calling elections. He can't call elections because the PA fears it would lose them and Hamas, which rules the Gaza Strip, won't let them be held there. His real motivation is to prove hardline; get all; gain leverage. As for frustration at the stalemate, it is easily demonstrable that Abbas and the PA are precisely those responsible for the lack of progress. Instead, the Palestinians are always presented as victims, passive observers, people who have nothing to do with their own fate. Ironically, despite its "progressive" packaging, this world view arises from the same place as imperialist-racist thinking that these are "primitive" people who don't have any ideas or goals of their own. They are mere reflections of what "we" do and hence perpetual victims. They cannot take responsibility, they can only be acted on and then reflect what is done to them. Thus, everything must always be the fault of Israel or America or the West. Palestinians never actually "do" anything. The fact is that their basic problem arises from their strategy of seeking Israel's destruction over a compromise peace that would mean the conflict's end in a permanent two-state solution. This is clear in any accurate factual account of what has happened. That Yasser Arafat and the Palestinian leadership were offered a Palestinian state with its capital in east Jerusalem and billions of dollars in start-up funding twice in the year 2000, at Camp David and in the December 2000 plan of president Bill Clinton. That instead they launched a war against Israel that went on for five years and cost thousands of lives. Having lost that war they dug in with intransigence that has lasted to the present day about negotiating a just and lasting peace. After all, Abbas is now refusing even to negotiate with Israel. Instead, the PA prefers to negotiate a partnership with Hamas, which would be in place now if the PA's demands weren't too high for the radical Islamist group that rules the Gaza Strip. Palestinian politics is so riddled with extremism that Hamas with its genocidal, anti-Semitic fight-for-a-thousand-years-who-cares-how-many-people-get-killed policy has a broad appeal on a basis of decades of PLO propaganda to the same effect. And why did Abbas hit a "dead end"? Why is there a "morass"? Could it be he is weak, the leadership in general extremist, and the movement is not interested in or capable of making peace with Israel, despite the extravagant offers made by former Israeli prime minister Ehud Olmert for a comprehensive settlement? The story of the resignation, election call and unilateral independence declaration fits in this context. The United States reached a deal with Israel that should have been satisfactory. Israel agreed not to start any more apartment construction on existing settlements once the current 3,000 units are finished. This did not apply to Jerusalem. Secretary of State Hilary Clinton rightly saw this as a huge concession especially because Prime Minister Benjamin Netanyahu placed his coalition in jeopardy to do it and got nothing in exchange. Abbas, however, basically ignored this deal and demanded that all construction must stop right now or he wouldn't talk at all. In addition, he rejected, after a brief wait, a U.S. request that he not push the tendentious Goldstone report in the UN. After all, Obama reasoned, claiming that Israel is a war criminal and demanding it be severely punished was not conducive to making peace with it. The PA leadership rejected Obama's request, with the leaders competing with each other and Hamas to prove their militancy. So it organized riots in Jerusalem, and embarked on the charade of Abbas's resignation (to mobilize support for him), pretending to call elections (to prove its backing by the masses), and play at a UDI move. - Its actual goal is Israel's elimination, not stabilization in a two-state arrangement. - If it makes any agreement, it would only be with loopholes allowing a second stage of struggle to achieve that goal, something Israel would not accept. Examples include refusal to have an unmilitarized state, give security guarantees, agree to settle all Palestinian refugees in Palestine, accept Israel as a Jewish state, or even specify a full peace treaty ends the conflict and Palestinian claims forever. - To negotiate a peace treaty with Israel would force the PA to make concessions which would not be popular, much of the leadership opposes, and Hamas would use as leverage to claim the PA has committed treason. Consequently, it is far more appealing to ask outside powers to give the PA a state without having to bargain at all with Israel. This gambit isn't going to work. Of course, if the Palestinian leadership wanted to end the "occupation" and get rid of settlements on its territory there's a simple solution. It need merely negotiate peace with Israel as soon as possible. This could all have happened years ago. The fact that it isn't happening now or for years to come is due to the PA's rejection of peace. To keep the door open for total victory in the future, to avoid compromising, to prevent internal conflict, it is willing to wait much longer, let its people suffer, and use both real and fictional suffering as leverage in an attempt to get far more. (IsraelNN.com) Defense Minister Ehud Barak justified his decision to participate in the Likud-led government at a Sunday night meeting of Labor party activists at the Tel Aviv Exhibition Grounds. Responding to internal criticism of his decision to sit together with Prime Minister Binyamin Netanyahu, the Labor chairman explained that without the inclusion of his party in the coalition, a narrow nationalist government would never have been able to freeze Jewish construction or move forward with the creation of an Arab state in Judea and Samaria. Noting that Sunday was the 62nd anniversary of the passing of United Nations General Assembly Resolution 181 that recommended the partition of western Palestine into separate Jewish and Arab states, Barak said that the intent of the international community in 1947 was to create two states for two peoples. He added that in addition to trying to bring the U.N. General Assembly’s 62-year-old recommendation to fruition, there were a number of additional matters that showed the Labor party to be a central force in Netanyahu’s coalition. PM Netanyahu cancels trip to Berlin over "viral infection" . Prime Minister Benjamin Netanyahu and his cabinet on Sunday were forced to cancel their planned visit to Germany, after the premier fell ill and was advised by his physician not travel. The prime minister was diagnosed with a viral infection and a light fever late Sunday evening, after returning from the Eilat Journalist Conference. His doctor recommended he stay home however, to recuperate from the virus. He and his ministers were supposed to travel to Berlin for a joint cabinet session with their German counterparts, a symbol highlighting the two nations' bond six decades after the Holocaust. The session has been postponed until a later date. An official at the PM's Office reported that Netanyahu had begun feeling unwell in the morning hours, but took part in a Likud minister's meeting and in the weekly cabinet meeting. In the afternoon, the prime minister delivered an address at the Eilat Journalism Conference despite his condition. While flying back from the southern city the prime minister complained of pains, and he was examined by his personal doctor upon landing. The doctor recommended that Netanyahu remain in Israel in order to recover from the illness. The prime minister's advisor, Uzi Arad, telephoned senior officials in the German chancellor's office after it was decided that the prime minister and his entourage would not be able to arrive in Berlin as planned. The German officials consulted Merkel and decided not to hold the meeting between the two governments without the prime minister. Aides to the prime minister said he was not suffering from any serious medical condition, just a virus that requires rest and abstention from extraneous activities. Prime Minister Benjamin Netanyahu said at the Eilat Conference for Journalism that it is now clear to every objective observer that Israel wants peace. He noted, however, that he does not see the same willingness or determination on the Palestinian side. 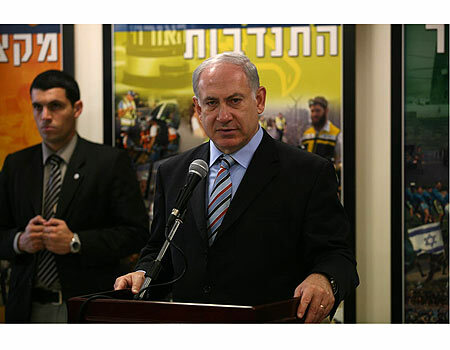 The prime minister addressed the cabinet's decision to freeze the construction in settlements for 10 months. "I think that today it is clear to anyone who checks the facts that Israel wants peace. It wants to enter a peace process," he stated. "I don’t see the same willingness, the same determination, on the Palestinian side yet. I see other signs. I see all kinds of preconditions for talks from the very first moment. I see them turning to the International Criminal Court or to the UN institutions in a bid to promote the absurd thing known as the Goldstone Report." He called on the Palestinians to help startup the peace process. "Eventually, the agreement or arrangement will be difficult, it will require courage from leaders, and we won't be satisfied, but neither will the other side. It's as clear as daylight. It requires rising above, it requires largely abandoning tactical moves. We are heading to a move. To this moment it's unclear to me whether the Palestinian Authority and its leader are ready to enter this move. "The people of Israel and the Palestinians themselves," Netanyahu explained, "are tired of the ongoing war and would like to reach a peace agreement. I hope the Palestinians do what is best for peace, and I'm telling you, what is best for them too. Because the alternative not to do it, not to advance a diplomatic process, will only benefit Hamas and its sponsor Iran and their different allies." (Reuters).Iran warns it will cut cooperation with UN, two days after IAEA votes to rebuke Tehran over secret enrichment plant. The new enrichment plants would be the same size as its main enrichment complex at Natanz, state broadcaster IRIB reported. Hardline President Mahmoud Ahmadinejad said Iran should aim to produce 250-300 tons of nuclear fuel a year, it added. State broadcaster IRIB said location of five the new plants had already been decided and that work on these should start within two months. At the same time, the parliament agreed that its Atomic Energy Organization should find suitable location for other five. Earlier Sunday, Iran's parliament speaker said Tehran could move to reduce its cooperation level with the United Nations nuclear agency watchdog if the West continues to pressure the Islamic state over its nuclear program. "If you do not stop these ridiculous carrot-and-stick policies, wewill in return adopt new policies and seriously decrease cooperationwith the International Atomic Energy Agency," Larijani, an influential conservative, told the assembly. (nydailynews-Editorial)Here's the latest dispatch from the annals of the "evenhanded" Mideast peace process - in which the Obama administration applies ever more pressure on Israel to make all manner of off-the-point concessions when it is clear that Palestinians' refusal to accept the very existence of the Jewish State is the insurmountable obstacle to progress. Israel declared it was freezing residential settlements on the West Bank for the next 10 months, satisfying one of the chief demands of the Obama administration and of the Palestinians. Prime Minister Benjamin Netanyahu called this a "painful" step, and indeed for many Israelis it will be. Secretary of State Clinton hailed the freeze, saying it "helps move forward toward resolving the Israeli-Palestinian conflict." And as a reward for this supposedly momentous concession, the Palestinian response was: Take your freeze and stuff it. They refused to return to the negotiating table because the Israelis reserved the right for Israelis to settle in East Jerusalem. Yes, in Jersualem. Give them a square inch, they'll demand a square yard. And keep threatening and committing violence and demanding more. Because haggling over settlements has been merely a pretext for shunning progress toward a two-state peace, including recognition of Israel. This is a truth that President Obama may now be waking up to - as he must. Tony Blair Defends Obama On Israeli-Palestinian Conflict - "There is a way through here"
(Huffingtonpost).Former British Prime Minister Tony Blair came to President Barack Obama's defense on Sunday after a scathing New York Times editorial accused the White House of losing legitimacy and strategic standing on the Israeli-Palestinian conflict. Appearing on CNN's "State of the Union," Blair urged, above all, patience in resolving a problem that has confounded so many previous administrations. I don't, actually. I mean, it won't surprise you to know. I think that, first of all, let me tell you that I have worked with Senator George Mitchell on the Northern Ireland peace negotiations. We work together very closely. He is, in my view, one of the most skilled and strategic negotiators I've ever come across. Secondly, I think President Obama, Secretary Clinton are completely committed to doing this. But third and perhaps most important of all, I went through situations in times in the Northern Ireland process where people were convinced the thing was going to fail. Where even at times, I found it difficult to see a way through. But you know, the thing is, there is a way through here. Because in fact both parties want to achieve a two-state solution. Actually, the Palestinians have made significant progress on security. in fact, the Israelis are prepared, in my view, to change significantly their posture on the West Bank. And if we can get [captured Israeli soldier] Corporal Shalit released, than a major change in the way that we view Gaza. It's not without hope. And here's the thing... There is no alternative but to keep trying. The alternative to a two-state solution is a one-state solution and that will, I assure you, be a hell of a fight. So I think when we look at the various strands of negativity there are around at the moment and there always are in these negotiations, there are, nonetheless, positives. We've got to seize on them, work on them, and make sure that we bring about a situation in which the central strategic objective of President Obama, which is right at the outset of his administration, to make this process count and work is achieved. AP, WaPo).Israeli Prime Minister Benjamin Netanyahu heads to Berlin Monday for a special joint session of the German and Israeli governments, a symbolic visit highlighting the two nations' bond six decades after the Holocaust. It is the first time an Israeli government will convene in Berlin, the former headquarters of the Nazi regime. The visit is more than ceremonial: High on the agenda will be Germany's latest push to win the release of a captive Israeli soldier held by Hamas militants in the Gaza Strip. There have been growing signs in the past week that the sides are close to a deal to exchange hundreds of Palestinian prisoners for the soldier. Netanyahu said Sunday that the visit would focus on Mideast security and diplomacy. "Germany is a loyal partner in the great efforts to promote peace and strengthen security," he told his Cabinet. Since the two countries established diplomatic ties in 1965, Germany has become perhaps Israel's strongest ally in Europe. Germany is Israel's second-largest trade partner - after the U.S. - and the Germans have played a leading role in international efforts to curb Iran's nuclear ambitions. It also has paid $39.4 billion to Holocaust survivors in Israel. Monday's session follows a historic visit last year by German Chancellor Angela Merkel and her Cabinet to mark the 60th anniversary of Israel's independence. She addressed the Israeli parliament and expressed shame over the Holocaust. At the end of Merkel's 20-minute speech, delivered in German, legislators gave her a standing ovation. Merkel's spokesman, Ulrich Wilhelm, said the top themes Monday would include environmental issues, economic cooperation and "progress of the Middle East peace process." He said the international effort to halt Iran's suspect nuclear program would also come up. Though not on the official agenda, the German-mediated efforts to arrange a prisoner swap between Israel and Hamas will certainly be discussed. Wilhelm would say only that Germany is "ready to give help and support wherever it is possible and wanted." Netanyahu's entourage will include seven Cabinet ministers - including his defense and foreign ministers - who will meet separately with their German counterparts. "This is a serious upgrade of the relations to the highest level possible," said Deputy Foreign Minister Danny Ayalon, one of the participants on the trip. "Today we mark the 29th of November, on which the UN approved General Assembly Resolution 181 to establish the Jewish State. The basis of a Jewish State is, first if all, a Jewish army, the IDF, and it is founded on the recruitment and volunteerism of our youth. This year there has been a welcome increase in the level of recruits, in number, including those going to combat units – a 7% increase. All those who are eulogizing and have discounted the enlisting and fighting spirit of our youth are invited to visit the main induction center. I intend to do so in the near future. You will be convinced that there are youth who are full of motivation, full of power, full of ability that enlist and, when necessary, fight, and support fighters. There is a welcome change. We will hear a relevant briefing, and the ministers will be able to be directly inspired from the impressive data. Tomorrow I, and a group of ministers, will depart on a one day visit to Germany. These visits were decided upon during the previous Government by the Chancellor Angela Merkel who proposed that the Israeli Government and the German Government meet each year. The previous visit was held here in Israel, the current visit will be in Berlin. We will discuss a number of issues, each minister in his own sphere. During this visit two subjects stand atop our agenda. The first is diplomatic-security, which has important ramifications regarding Israel's defensive capabilities. Germany is a true partner in the great efforts to both advance peace and strengthen security. The second subject is renewable energy, replacing petroleum and protecting the environment. I would also like, together with all ministers, to take this opportunity, in addition to what we have already published/once again, to greet our Muslim brothers on Eid al-adha. (Ynet).Addressing the cabinet's recent decision to temporarily halt construction in the West Bank, Deputy Foreign Minister Danny Ayalon said Sunday, "I hope the Arabs won't repeat the missed opportunity of November 29, 1947 Arabs and miss the chance to achieve peace yet again." "(Prime Minister Benjamin) Netanyahu's decision to freeze the settlements is historic and unprecedented," Ayalon told a conference held at the Hebrew University in Jerusalem. "Today there is a real opportunity, which is no less important than UN Resolution 181 (called for the partition of the British-ruled Palestine), to reach a peace agreement with the Palestinians. The problem is that the Palestinians never miss an opportunity to miss an opportunity," he said. "Since 1993 there has been an asymmetry in the concessions made by Israel and the Palestinians. Israel has given up on a lot, but the Palestinians have refused to budge and have not made any progress regarding Jerusalem, the refugees, the borders and the recognition of Israel (as a Jewish state)". "Israel is determined to continue the peace process - but it takes two sides," said the deputy FM, "I call on the Palestinians to come to their senses and enter negotiations for peace." (Jpost).Prime Minister Binyamin Netanyahu will not allow the Likud central committee to convene to debate his decision to freeze construction in Judea and Samaria, sources in the Prime Minister's Office said Saturday night. Speaking in Ra'anana, at an event under the banner "Real Likudniks don't surrender," Likud MK Danny Danon told a crowd of some 200 party activists and settler leaders that on Sunday morning, he would deliver the required number of signatures ofcentral committee members to force a meeting of the committee to its chairman, Communications Minister Moshe Kahlon. "The prime minister should have told the Americans that on Judea and Samaria, he would not surrender," Danon said. 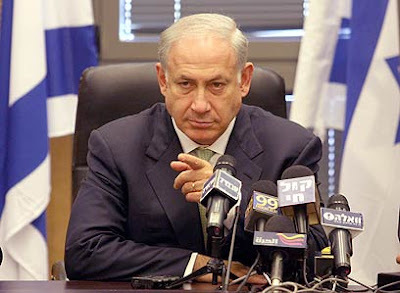 "We are starting a campaign to put the brakes on what Netanyahu is trying to do. We will be attacked for this and it won't be easy, but we, the silent majority of the Likud, will struggle and succeed." Netanyahu's associates said that despite the signatures he could still avoid convening the committee. They said that even if there will be a meeting of the committee in a couple of months, it would deal only with procedural matters. A source close to Netanyahu admitted that he had called Likud ministers and MKs and persuaded them not to come to Danon's event, which was not attended by any other MK. Danon stressed at the event that his goal was not to topple Netanyahu but to strengthen him. Speakers at the event outdid one another in insulting US President Barack Obama. Netanya Likud activist Ben-Zion Ben-David said, "We overcame Pharaoh, Antiochus, and Salah a-Din. We'll overcome Obama too." Mr. Netanyahu has since offered a compromise 10-month freeze that exempts Jerusalem, schools and synagogues and permits Israel to complete 3,000 housing units already under construction. The irony is that while this offer goes beyond what past Israeli governments accepted, Mr. Obama had called for more. And the Palestinians promptly rejected the compromise. Washington isn’t the only one to blow it. After pushing President Obama to lead the peace effort, Arab states, especially Saudi Arabia, refused to make any concessions until settlements were halted. Mr. Mitchell was asking them to allow Israel to fly commercial planes through Arab airspace or open a trade office. They have also done far too little to strengthen Mr. Abbas, who is a weak leader but is still the best hope for negotiating a peace deal. Ditto for Washington and Israel. All this raises two questions: What has President Obama learned from the experience so he can improve his diplomatic performance generally? And does he plan to revive the peace talks? The president has no choice but to keep trying. At some point extremists will try to provoke another war. and the absence of a dialogue will only make things worse. Advancing his own final-status plan for a two-state solution is one high-risk way forward that we think is worth the gamble. Stalemate is unsustainable. (YNet).The recipe for peace between Israel and the Palestinians includes negotiations, honesty, immediate talks on the core issues, and the establishment of a demilitarized Palestinian state – this is the vision presented by Costa Rican President Oscar Arias in a special interview with Ynet. In an interview with Ynet after meeting with Prime Minister Benjamin Netanyahu, Arias said his attempt to promote Israeli-Palestinian peace stems from Costa Rica's unique history. In 1948, the year Israel was established, the Latin state approved its new constitution, which abolished the army. "I think the whole world expects both sides to return to the negotiating table," Arias said, adding that he shared with Netanyahu his personal peace-making experience. Contacts must be held at the highest levels and the talks must be personal, he said. "You have to look your opponent in the eye," he said, noting that late PM Rabin also stressed that peace is made with enemies. The Costa Rican president said he accepted Netanyahu's call for a demilitarized Palestinian state. He noted that in his talks with the Palestinians he seeks to convince them to do without a military. "A small, poor state like Palestine doesn't need an army," he said, adding that some courage is needed to take such decision and expressing his hope that the Palestinian Authority will have the courage to adopt such step. (AP).Palestinian leader Mahmoud Abbas dismissed an Israeli plan to temporarily halt new construction of West Bank settlements as insufficient on Friday, saying Prime Minister Benjamin Netanyahu chose occupation rather than peace. The Palestinian president said during his first visit to Venezuela that "we can't accept the current Israeli government's concept for the negotiations." "We don't have any condition to restarting negotiations except the commitment of the two sides to the foundations of the peace operation according to the road map, and especially stopping the expansionist activities of the Israelis," Abbas told lawmakers, speaking through an interpreter. He said Wednesday's announcement by Prime Minister Netanyahu of a 10-month halt to new construction in West Bank settlements didn't bring anything new because the occupation is going to continue in the West Bank and in Jerusalem. (Ynet).The Foreign Ministry on Friday praised the UN nuclear watchdog's decision to censure Iran over its covert uranium enrichment plant, calling the decision "extremely important". The ministry said a time schedule must be set for the International Atomic Energy Agency's resolution, which calls on Iran to immediately halt construction of the Fordow enrichment plant and confirm it has no other covert plants, and that if Iran were to stray from the time schedule it should be sanctioned. "Israel commends the resolution regarding Iran, which was passed today during a meeting of the agency's board of directors, after a three year period in which no resolutions were made on Iran within this framework," the ministry said in a statement. "The significance of the resolution is that it determines that Iran continues to violate Security Council and IAEA resolutions." The Foreign Ministry added that the resolution proves the international community is concerned about such secretive behavior on the part of Iran. "The passing of the resolution with such a huge majority proves the international community has concluded that Iran's nuclear program, progressing through deceit and concealment, has become a significant and urgent danger to world peace," the statement added. A US official said the world should send a clear message that Tehran will face consequences if it fails to engage with major powers on the nuclear issue, but added that the US fears more sanctions would harm the Iranian people. "We hope that the board of governors resolution reinforces the message that, you know, we're committed to putting together a package of consequences if we don't find a willing partner. We hope Iran takes note of that clear message," the official told reporters. British Prime Minister Gordon Brown called the IAEA resolution "the strongest and most definitive statement yet made by the countries who are very worried about nuclear ambitions on the part of Iran." (FOXnews).Sources close to officials negotiating for the release of kidnapped Israeli soldier Gilad Shalit tell Fox News that a deal to secure his freedom will likely be concluded next week, when Israeli Prime Minister Benjamin Netanyahu returns from a trip to Germany. A major remaining sticking point is disagreement over where to deport Palestinian prisoners from East Jerusalem. Egyptian sources say that Hamas still needs to come back to Israel with answers on a handful of issues. But an official response is not expected until after the Muslim holiday of Eid al-Adha (Feast of the Sacrifice), which begins Friday and ends Monday. Still, the latest developments indicate that the two sides have narrowed their differences. "What we are seeing now is the end game," said one source close to the negotiations, who asked not to be named because he is not authorized to speak on the record. Both sides, however, also expressed caution that a final agreement is very close, but has not yet been agreed upon. (Americanthinker).The Obama administration, following Netanyahu's unilateral announcement of a temporary settlement freeze, has agreed on a quid-pro-quo that builds on a similar precedent set by Ariel Sharon and George W. Bush in 2004. In exchange for Bibi's unprecedent move, the administration for the first time acknowledged specifically that Israel will be entiteled to retain lands captured in 1967 as part of any final peace agreement. Five years ago, Israel's decision to unilaterally withdraw from Gaza in hopes of advancing the peace process was rewarded by a reciprocal Bush assurance to Sharon that the U.S. would, as part of any final peace deal, support "secure and recognized" borders for Israel and, that "in light of new realities on the ground, including existing major population centers, it is unrealistic to expect a full and complete return to the 1949 armistice line." Bush's letter also noted that "all previous efforts toward a two-state solution have reached the same conclusion," including the generous Clinton Barak initiative at Camp David in 2000. Translated from diplomatic jargon, this meant that Israel could be expected to retain major population centers beyond the pre-1967 line like Maale Adumim and Gutsh Etzion. Significantly, Bush's assurances put the U.S. on Israel's side in rejecting insistence by the Palestinian Authority and Arab leaders on a complete Israeli withdrawal to the pre-1967 line, also known as the Green Line, also known, as spelled out by Bush, as the 1949 armistice line. Now, five years later, Netanyahu takes a leaf from Sharon and unilaterally decides on a temporary 10-month construction freeze in West Bank settlements in hopes of reactivating peace negotiations. And, at the same time, Hillary Clinton takes a leaf from George W. Bush and states on the record that the United States expects the Palestinians to agree to "land swaps" to modify the pre-1967 line and, even more importantly, expects Israel to end up with "secure and recognized borders that reflect subsequent developments and meet Israeli security security requirements." Whichever way you cut it, Bibi got quite a bit of quo for his quid from Team Obama. Note also that Hillary's parameters for a final peace deal are totally silent about East Jerusalem, which the Palestinians demand as the capital of their future state, and fail to mention any "right of return" for Palestinian refugees -- even as they provide for the first time specific security commitments to Israel with regard to final borders. But the specificity of Hillary's new statement about Israel's security requirements and final borders will not bend easily to any White House attempts to dilute the clear message from its secretary of state binding the U.S. to Israel's retention of built-up population centers beyond the Green Line. Call it Hillary's Thanksgiving present to Bibi. (PATRICK MARTIN-GlobeandMail).When it comes to making peace, no matter what initiative he announces or policy he implements, Israeli Prime Minister Benjamin Netanyahu is usually met with criticism from the Israeli left, the Israeli right and from Palestinians on all sides. Yet a closer look at some of these policies and practices reveals a concerted effort to make real inroads. Driving through the towns of the West Bank, one can see and feel the difference from conditions that existed only a few months ago. The cities of Jenin, Nablus, Ramallah and Hebron all display new-found vitality. Jenin has become a shopping destination for Israeli Arabs. Nablus's historic market is packed with Palestinians from all over the West Bank. Ramallah and Hebron are bustling cities where people enjoy normal lives. The reason is the withdrawal of Israeli soldiers in recent months and the elimination of many of the checkpoints between Palestinian communities. The West Bank town of Bethlehem is seen in the background as labourers work on a construction site in Gilo, a Jewish settlement. When Mr. Netanyahu was elected in February, he played down the importance of endless negotiations and urged what he called an economic peace, a simple improvement in the daily lives of Palestinians. He was greeted with derision. To be sure, there remain terrible indignities and frustrations that Palestinians suffer in moving between certain areas, especially into Jerusalem, where the Israeli military presence continues. As well, Palestinians lack a real sense of permanent security and independence. But daily life is a lot better than it has been for years. In another controversial move, Mr. Netanyahu's government has quietly been negotiating a prisoner exchange with Hamas, the militant movement that has used terrorist tactics and currently holds an Israeli soldier, Gilad Shalit, hostage. Until recently, there has been little knowledge of what this deal might entail, but it now appears likely that among the hundreds of Palestinians to be released are major figures in the resistance. These may include Marwan Barghouti, a leader of the intifadas and a candidate for president of the Palestinian Authority who is currently serving five life sentences for his part in ordering deadly attacks on Israelis. Palestinians close to the Hamas leadership say the prisoner deal will include a partial lifting of Israel's blockade of Gaza to allow for the reconstruction of buildings and neighbourhoods destroyed during Israel's offensive one year ago. This would appear to be a response to Hamas's announcement last weekend that it will no longer allow Gaza to be used as a base for rocket attacks on Israel. All this suggests the depth of the Netanyahu government's engagement with Hamas. This week alone, Israel announced it is withdrawing its forces from the northern half of the town of Ghajar, a community on the Lebanese border that has been occupied since the end of the Israel-Lebanon war in 2006. On Wednesday, Mr. Netanyahu announced a 10-month freeze on construction in Israeli settlements in the West Bank. While critics can point to the many exceptions that will permit a great deal of construction to continue, it is a move in the direction of peace. The Prime Minister appears to be sending a message to the Palestinians that the freeze is just the beginning if they choose to come to the table. "I think he's signalling to his camp, and to the enemy, that he's serious about negotiations," says Moshe Ronen, chairman of the Canada-Israel Committee and a long-time friend of Mr. Netanyahu. Chief Palestinian negotiator Saeb Erakat dismissed Mr. Netanyahu's proposal, which he said contains "no change in the status quo of settlements, occupation and Israel's daily violations of international law." The Israeli right denounced it for giving away too much and getting nothing in return. But Mr. Netanyahu welcomes the criticism; it shows he's not being dictated to by either side. And what some see as lack of resolve can also be viewed as political pragmatism. Says Mr. Ronen: "He's showing there's a lot on the table, and that he's willing to discuss almost anything." Yossi Verter/ Two B's or not two B's- The Consensus leader discovering how strong he is! Yossi Verter-Haaretz)....Every day Prime Minister Netanyahu is discovering anew how strong he is: He declared his support for two states for two peoples, he is suspending in practice - and as of this week, also formally - construction in the territories, and he apparently intends to resume peace talks with the Palestinians. During his short tenure as prime minister, the Likud's relations with the right and the settlers have been perhaps irrevocably torn apart. He has succeeded in crossing these Rubicons with minimal damage. And the internal opposition he is dealing with is laughable: MKs Tzipi Hotovely, Danny Danon and Yariv Levin. If Netanyahu makes a major diplomatic move vis-a-vis the Palestinians, the Syrians, or both - an increasingly reasonable assumption - he will win considerable public support, like former prime minister Ariel Sharon did during the Gaza Strip disengagement. In such a case, he might well take advantage of the momentum to split the Likud again, taking with him a third of the faction members including ministers, just as Sharon did in November 2005, to establish a New Likud along with Defense Minister Ehud Barak, who will likely be glad to leave the Labor Party with its huge debts and terrible image. Thus, on the wake of a popular and groundbreaking diplomatic agreement, Netanyahu and Barak will step into the shoes worn by Sharon and Shimon Peres four years ago, with the elderly Peres, now president, as sponsor. The cooperation between Netanyahu and Barak is deeper and far more meaningful than the usual relations between a prime minister and a defense minister; some people think Barak has been hoping for this from the moment he entered the government. A government of B's - Bibi and Barak - may be his last opportunity to succeed Netanyahu as prime minister. As for the latter, in less than a year he has shed all his principles in favor of a new and far more pragmatic route. Today's Likud is becoming more centrist, which is evident in the latest public opinion polls: Labor is losing votes to Kadima, which is losing votes to Likud, which is losing votes to the National Union. Netanyahu has considerable support - more than U.S. President Barack Obama - from the center left and the moderate right. Benjamin Netanyahu, the politician who has written more than anyone else and preached more than anyone else against freeing jailed terrorists in exchange for hostages, will likely henceforth be identified, eternally, with what is being called "the Shalit deal," over kidnapped soldier Gilad Shalit. He, who has written books about the war on terror, is about to do, and in effect already has done, something that contradicts and refutes everything he has written. Since taking office less than a year ago, Netanyahu's principles and declarations of the past have been put to the test repeatedly, and each time anew, reality emerges victorious. In 1995, before he was elected prime minister for the first time, the first edition of his book "A Place under the Sun" was published by Yedioth Ahronoth Books. That was 10 years after the Jibril deal, when the unity government headed by Peres released 1,150 Palestinian prisoners and detainees in return for three Israeli captives. Netanyahu also described in his book a letter he wrote to then-Likud leader Yitzhak Shamir, Peres' partner in the unity government. Perhaps a few individuals were rescued as part of the Jibril deal, he wrote Shamir, but it is clear that this has been done at the price of many people who are fated to die because of this decision. A state has to act judiciously, above all for the benefit of the collective, Netanyahu noted, adding that he saw no possibility of justifying this step as being beneficial that way. Associates of the prime minister describe him as being composed and cool these days. He apparently made the strategic decision to end the Shalit affair several weeks ago. Since then, he has been managing things directly vis-a-vis mediator Hagai Hadas. His only full partner to the secret in the Prime Minister's Bureau is his military secretary, Maj. Gen. Meir Kalifi. Another full partner is Barak. Some people say Peres is also being briefed down to the slightest detail. This troika, Netanyahu, Barak and Peres - "the prime ministers' club," among whom there was once only bad blood - is now managing the State of Israel's most sensitive matters in glowing harmony, and without false notes. On the eve of the change in government less than a year ago, negotiations between Israel and Hamas had reached a critical stage. The headlines were similar to those that appeared this week. Outgoing prime minister Ehud Olmert was facing a crucial decision. A year earlier, Netanyahu had agreed to Olmert's request that the then-opposition leader would not thwart any agreement reached with Hamas over Shalit. Netanyahu was even prepared to delay the swearing-in of his government for a few days to give Olmert another chance to close the deal. Netanyahu was as heartbroken as Shalit's battalion of friends at the news that the negotiations had failed. The media wrote at the time about the "new right-wing government, with which the negotiations will be much harder." Yet, according to foreign sources, Netanyahu has moved things along much further than his predecessor dared. So much so that knowledgeable sources are saying that Olmert believes Netanyahu has conceded too much. However, as long as the negotiations are under way, Olmert is not going to say a word. At the Likud faction meeting on Monday, Netanyahu announced that when the deal has been completed it will be brought to the cabinet and the Knesset. The following day, during a tour of National Police Headquarters in Jerusalem, he declared it would be brought to the cabinet and "for public discussion." The prime minister is not obligated to bring the Shalit deal before the Knesset. It is enough to bring it to his ministers, who will likely give him a majority. Even ministers from his party who vote against it will do so only if they are certain he will not lose the vote. Before Netanyahu places the decision on the Knesset table, he would like to see 70 Knesset members - at least - supporting it, versus 10 to 15 opponents. Therefore, and with the requisite secrecy, his envoys have been feeling out the various factions and examining what can be expected in the plenum. (Haaretz).Prime Minister Benjamin Netanyahu on Thursday denounced the negative remarks made by Culture and Sports Minister Limor Livnat (Likud) about the Obama administration. Livnat on Thursday slammed the government's decision to agree to a 10-month settlement freeze. She also criticized the administration of U.S. President Barack Obama and said, "I do not envy the prime minister.We have fallen into the hands of a terrible U.S. administration." Criticizing the move at a Likud conference in Be'er Sheva, Livnat said, "No Israeli government has ever made such a decision, and I ask myself what are we getting from it?" "This is a unilateral step,we know that the Palestinians will not enter into negotiations with us.Within a week,construction will start on housing units (in the West Bank) that had been previously approved, and then we will be accused of being cheaters and scoundrels. "I know the prime minister is in distress; it is not easy to stand up against the US president, after the latter dragged him through a series of torments". "I feel uneasy with this unilateral decision; no one will appreciate it, and we will only get slammed for it,"
"Livnat's remarks in no way represent the stance of Prime Minister Netanyahu," a statement from the Prime Minister's Bureau said. "The prime minister has stated many times the appreciation he has for the strong bond between the U.S. and Israel, which continues with the Obama administration," the statement continued. The Prime Minister's Office said Minister Livnat's comments against the US administration "do not represent the prime minister's position at all. The prime minister has expressed his appreciation for the strong bond between Israel and the United States time and again – a bond that continues to remain strong throughout President Obama's administration. "(Netanyahu) also thanked the president and his administration for their commitment to Israel's security and the pursuit of regional peace," the PMO statement read. (IsraelNN.com) The decision to vote in favor of a government decision to temporarily freeze construction in Judea and Samaria was not an easy one, Minister Benny Begin told Arutz Sheva Thursday. “We considered the matter carefully and in the overall balance, despite the great difficulty in the decision, we need to weigh its advantages as opposed to its disadvantages,” he said. "After the ten months construction will be renewed, and it will be renewed not to the level it has been at in recent months, but to the level it was at before August 2008,” he promised. The minister-without-portfolio said that the nationalist public should form its opinion on the Netanyahu government by comparing it to previous governments. “In 2000 [Ehud] Barak offered to cede the PLO 95% of the territory and to carry out a land swap on all the rest. He also wanted to give up Israeli sovereignty on the Temple Mount. [Ehud] Olmert's Kadima government proposed a deal that would concede 98% of the total territory of Judea, Samaria and Gaza and to forgo Israeli sovereignty on the Mount of Olives. The 'Holy Basin' was to be administered by Arab states. The Likud would never think of making such offers,” he noted. FM Lieberman: Ball now in Palestinians' court -"What we could have contributed, we did". (JPOST).Israel "couldn't care less" about the Palestinian leadership's reaction to Prime Minister Binyamin Netanyahu's settlement freeze offer, said Foreign Minister Avigdor Lieberman on Thursday morning. During an Israel Radio interview, Lieberman stated that far more important were the reactions of the settlers and what he termed "Israel's friends around the world," chiefly those who had spoken up against the Goldstone Commission's Report. Although Israel has made more gestures in the last ten months than all previous governments, the Palestinians reacted by "cursing and quarreling," said Lieberman, adding that the ball was now "in their court." "What we could have contributed, we did," Lieberman said. "The Palestinians will make their considerations based on internal deliberations that don't need to concern us." Also speaking in support of the prime minister on Thursday, Deputy Foreign Minister Danny Ayalon said that the 10-month moratorium will prove that the settlements have never been an obstacle to peace. "This policy of restraint will prove once and for all that settlements have never been, nor will they ever be obstacles to peace," said Ayalon. He added, "This is only a limited window of opportunity. It will be sufficient to demonstrate whether the Palestinians are serious about peace or just serial excuse givers. The gazes of the international community will now turn to the Palestinians and to the Arab world, something that the Palestinians in particular have fought hard to prevent for the last eight months." (Shimon Shiffer-Ynet).The decision to halt residential construction in the settlements and the deal being formulated with Hamas have one thing in common: In both cases the Israeli side gives something and doesn’t get anything in return, or alternately, gets much less. The decision passed by Prime Minister Benjamin Netanyahu in the cabinet Wednesday regarding the halt of construction in Judea and Samaria was supposed to prompt an immediate response by Palestinian leader Mahmoud Abbas in respect to a Palestinian return to the negotiations table. Despite Netanyahu’s announcement that construction will be renewed following the 10-month freeze, anyone who has been monitoring the relationship between Bibi and Obama is convinced that even at the end of this period, no Israeli bulldozer will be making its way to a West Bank hill. The freeze will go on. Those who were unable to withstand the American and international pressure thus far will not be able to withstand future pressure. Netanyahu can seek comfort in one thing only. The pledges he made are “pretend pledges.” First, because for a long time now, no new construction plans have been approved in the settlements. On top of it, Netanyahu does not intend to put an end to the construction of thousands of residential units that are already in process, the construction of public buildings in the West Bank, or any kind of construction in Jerusalem. So is it any wonder that Benny Begin is an enthusiastic supporter of this “freeze”? (Akiva Eldar-Haaretz).Newspaper headlines across the world this morning will trumpet the courageous and unprecedented initiative of Israel's prime minister. Who could have imagined that the right-wing leader Benjamin Netanyahu and the settler Avigdor Lieberman would lend a hand to freezing settlement construction? How the settlers' fuses will blow. Now Daniel Ben Simon can end his love affair with the Labor rebels and go back to being faithful to Defense Minister Ehud Barak. Indeed, from Israel's point of view, the government took a major step yesterday. Prime Minister Netanyahu says the move is designed to return the Palestinians to the peace talks. If this is really his intention, the prime minister has managed (temporarily) to pass the hot potato to Palestinian President Mahmoud Abbas. No peace process will come out of it. It is hard to decide what would cause greater harm to whatever is left of Abbas' status in the Palestinian public - American pressure to settle with the deal Netanyahu offered him yesterday, or the prisoner-exchange deal that the prime minister is offering his great enemies in Hamas. It is unlikely that Netanyahu really believed Abbas would thank Israel's government for deciding to temporarily freeze the settlements in the West Bank, praise it for building synagogues and new schools, agree to the completion of 2,500 partially-built housing units and the construction of 492 new apartments. It is unlikely Netanyahu thought that on the eve of Id al-Adha the Muslim leader would adopt the Jewish people's position that East Jerusalem is part of the State of Israel. Is Netanyahu really expecting Abbas to recognize Israel's sovereignty on Gilo, not to mention Sheikh Jarrah and the Temple Mount? The really important question, which interests Netanyahu more than anything, is how U.S. President Barack Obama will view his proposal. This is not the first time an Israeli government has committed to freezing settlements. Tomorrow it will be two years since prime minister Ehud Olmert announced in Annapolis his commitment to open negotiations on the basis of the road map. In that detailed document, the Sharon cabinet undertook in May 2003 to suspend all activity in the settlements, including construction for natural growth. The list of 14 reservations attached to the cabinet decision said that the settlements in the West Bank would not even be discussed "except for freezing the settlements and removing the outposts." Freezing West Bank settlements, even temporarily, has become a necessary condition for saving the two-state solution and the Palestinian faction supporting it. Necessary, but by no means sufficient. In the absence of basic trust between the parties, even if Netanyahu continues to shove building permits into the drawer, as he has been doing since he returned to the prime minister's desk, it won't suffice. Prime Minister Benjamin Netanyahu said this evening in a private conversation after the Cabinet meeting that " the Tough , not easy decision that we took reflects the power of the unity government and the national concurrence of enlargement around our positions. Now the Palestinians have no more excuses. The ball is situated in the field of Abu Mazen and its upon him to take on a courageous decision of a leader. *Vice Prime Minister Moshe Ya'alon spoke to senior Likud ministers following the Political-Security cabinet's vote on a temporary freeze in settlement construction and praised the move. "The prime minister should be supported. This move will settle the relations with the Americans and strengthen them," Ya'alon said. *Foreign Minister Avigdor Lieberman commented on the settlement freeze issue during the cabinet meeting and said that Israel has a commitment to Jewish settlers in the West Bank. "At the end of 10 months we shall resume construction," Lieberman said. *Industry, Trade and Labor Minister Binyamin Ben-Eliezer (Labor) said after the vote, "It’s an important and historic decision, one of the most important decisions this government has made. The decision will leave the Palestinians with only one choice – join the political negotiations. They have no reason to stall anymore." *An official Kadima statement read, that the party "supports any move that will return Israel to negotiations toward a final settlement, which will preserve Israel's national and security interests, just like we conducted and from the point they left off." The Obama administration welcomed Israel's decision Wednesday to freeze new construction in settlements in the West Bank temporarily as a step toward resolving the Israeli-Palestinian peace talks. Secretary of State Hillary Rodham Clinton issued an approving statement moments after Prime Minister Benjamin Netanyahu announced in Jerusalem the launching of a 10-month moratorium on settlements in the West Bank. "Today’s announcement by the Government of Israel helps move forward toward resolving the Israeli-Palestinian conflict. We believe that through good-faith negotiations the parties can mutually agree on an outcome which ends the conflict and reconciles the Palestinian goal of an independent and viable state based on the 1967 lines, with agreed swaps, and the Israeli goal of a Jewish state with secure and recognized borders that reflect subsequent developments and meet Israeli security requirements. Let me say to all the people of the region and world: our commitment to achieving a solution with two states living side by side in peace and security is unwavering". At the State Department, the administration's special envoy for Middle East peace, former Sen. George Mitchell, told a news conference that the Israeli decision could mark a step toward restarting peace talks. "It falls short of a full settlement freeze, but it is more than any Israeli government has done before and can help movement toward agreement between the parties,Nothing like this occurred during the Bush administration." "The government of Israel has taken a very big stop towards peace today." Israel's Prime Minister Benjamin Netanyahu announces that the Political - Security cabinet approved the plan to freeze building in settlements for a period of 10 months in press conference in Jerusalem this evening. Prime Minister Binyamin Netanyahu announced a ten-month settlement freeze at a Jerusalem press conference on Wednesday evening after the security cabinet approved the plan, and said the move was a "far-reaching and painful step,It's not an easy step and we are taking it out of broad national considerations." "I hope that this decision will help launch meaningful negotiations to reach a historic peace agreement that would finally end the conflict between Israel and the Palestinians,We have been told by many of our friends that once Israel takes the first meaningful steps toward peace, the Palestinians and Arab states would respond." "Leadership is judged by its ability to make the necessary decision when called upon to do so… I committed to permitting residents of Yehuda and Shomron to maintain a normal life, and as such, shuls, schools and kindergartens, along with public buildings, will be built as needed towards achieving this goal". "My position pertaining to Jerusalem is known- We do not put any restrictions on building in our sovereign capital,and there will be a homogenous balance, permitting Arabs and Jews alike to build…." "Now is the time to begin negotiations, now is the time to move forward towards peace,Israel today has taken a far-reaching step toward peace, it is time for the Palestinians to do the same." "Israel's government has made an important step toward peace today, let us make peace together." (Ynet).The Political-Security Cabinet approved Wednesday evening Prime Minister Benjamin Netanyahu's proposal to halt construction in the West Bank settlements for a period of 10 months. Eleven ministers voted in favor of the plan, while Infrastructure Minister Uzi Landau opposed the initiative, which was coordinated with the US in an effort to jumpstart the Israeli-Palestinian peace negotiations. Interior Minister Eli Yishai (Shas) and Housing and Construction Minister Ariel Atias were absent from the vote. "In the international circumstances that have been created, this step will advance Israel's broad international interests. This is not a simple step, nor an easy one; but it has many more advantages than disadvantages," Netanyahu told his aides. "Under the current international circumstances, this step moves the broad national interests of Israel forward. This is not a simple step, not an easy one, but it has more advantages than disadvantages. It enables us to present to the world a simple truth- the Israeli govt. wants to enter negotiations and is very serious in its wish and its intentions to move the peace process forward." Defense Minister Ehud Barak said at the security cabinet meeting, "The freeze on West Bank settlement construction is a responsible and reasonable decision." Furthermore, said Barak, the aim of the freeze would be to keep the window open for a renewal of negotiations with the Palestinians. "Israel is powerful and has a strong deterrent capability, but time is not necessarily on our side," continued the defense minister. "It is imperative to move towards a two state solution. There are no alternatives." Barak said that he hoped that the Yesha leadership, which is undoubtedly patriotic, responsible, and serious, would "understand the need for this decision at this time." Barak went on to say that the security cabinet's decision was based on an understanding with the United States pertaining to renewed negotiations. ( Gabor Steingart-Der Spiegel.de).US President Barack Obama is back in the US after an Asian trip that produced few results. There were only a few hours left before Air Force One was scheduled to depart for the flight home. US President Barack Obama trip through Asia had already seen him travel 24,000 kilometers, sit through a dozen state banquets, climb the Great Wall of China and shake hands with Korean children. It was high time to take stock of the trip. Obama visited a new China, an economic power that is now making its own demands. America should clean up its government finances, and the weak dollar is unacceptable, the head of the Chinese banking authority said, just as Obama's plane was about to land. (Ynet).Israel will not accept Hezbollah's membership in the Lebanese government and will hold Lebanon responsible for any military clash in the north, Defense Minister Ehud Barak said Tuesday. "We will not accept the equation whereby a UN member state is home to a militia in possession of 40,000 rockets but also parliament members and ministers," he said while meeting municipal leaders in northern Israel. "The Lebanese government is responsible for any clash rather than the Hezbollah, and all of Lebanon's systems will be held accountable." The defense minister noted that the government in Lebanon was sophisticatedly set up to resemble a normal state, while Hezbollah enjoys veto power and the freedom to act. "They entered the 2006 war with 14,000 rockets and missiles…today they possess more than 40,000 missiles with larger warheads," he said. Barak noted that Security Council Resolution 1701 has failed to curb Hezbollah's arming process, but said that "deterrence still exists." "There's clearly coordination with Iran and there will be attempts to infringe the balance of power on Lebanese soil and in Lebanon's skies," he said. "Should we become convinced that the balance has been compromised, we will be forced to consider our moves." (DPA,Haaretz).Palestinian National Authority President Mahmoud Abbas complained that U.S. President Barack Obama "is doing nothing for the peace process" in the Middle East so far. "For now he is doing nothing, but he has invited us to revive the peace process. I hope that in the future he can play a more important role," Abbas said in an interview published Tuesday by the Argentine daily Clarin. Instead, Abbas again called upon Brazilian President Luiz Inacio Lula da Silva to take a more active role as mediator in the Middle East. "He can do it, because he has good relations with the two parties in the conflict and I think he can help," Abbas expressed the hope that "the United States [will] put pressure on the Israelis to abide by international law, so that the roadmap can be implemented." He anticipated, however, that the Palestinians will not make any more concessions than they have already made. "We accepted to have only 22 per cent of Palestine, and that is the biggest concession. And we also accepted that Israel had 78 per cent. So, what kind of concessions are they expecting from us?" he said. "Now we are ready to announce our independence if the Israelis will allow us to," he said. Abbas said, however, that independence would not be declared unilaterally. "[The Israelis] are trying to say that we the Palestinians are seeking a unilateral decision. We are not seeking a unilateral decision," he said. And stop Pressure the elected government of Israel and Prime Minister Netanyahu and stop telling them which decisions they should take and where the citizens of Israel can build their homes and where not. The Israeli government is entitled to and must decide on policy when pressure is released, and a sober view of reality and the good of the country and its citizens safety and injury prevention. Is it conceivable Mr. Obama that you will agree that the President of the Soviet Union or any other state leader will tell you and your government which decisions you should take ? And where can the citizens of the United States of America can build their homes and where not ? Mr. President, A great clock stands above us , ticking. The significance of a nuclear weapons producing by Iran the a state that is the maim sponsor of terrorism and terrorist organizations like Hezbollah and Hamas is a real danger not only to the safety and security of Israel but to the safety and security of the all world and to the safety and security in the Western free world In particular! Ahmadinejad will not hesitate to use weapons of mass destruction. The world must set him an ultimatum and act immediately. And, as was already said by the British -Irish philosopher Mr.
"All that is necessary for the triumph of evil is good men that do nothing." The American people and the people of Israel, Mr. President Obama are sharing true friendship with many years and share the same values of ,democracy, Liberty , freedom, Humanism and brutal war Against terror. The terror that struck on September 11, thousands of innocent American citizens. May God give might to his people, may God bless his people with peace! Navon Katsav , Attorney of Law. (NYT). Amid reports that Israel and the Islamist group Hamas appear to be nearing a deal to exchange a captured Israeli soldier for hundreds of Palestinian prisoners, Prime Minister Benjamin Netanyahu sought on Tuesday to dampen speculation about a swap — either how close it was or whether it would happen at all. “There is still no deal, and I do not known if there will be one,” he said. Addressing the fears of some Israelis that a swap would boost the standing of Hamas, Mr. Netanyahu said the authorities would “not be sparing with a public discussion. We will not do it as a fait accomplish,” news reports said. "If and when a deal becomes apparent, [we won't make any backroom deal]. The decision will be brought to the government for it to decide." Expectations of a swap in the coming week, a move with far-reaching implications not only for stalled Middle East peace talks but for a range of regional relations, have been raised by a round of meetings in Cairo sponsored by the Egyptian government, and by a growing number of statements by Israeli, Palestinian and Egyptian officials. (Reuters).Palestinians will not launch a new uprising against Israel despite their frustration at the deadlock in U.S.-sponsored peace efforts, President Mahmoud Abbas said on Monday. Abbas made clear that Palestinians do not want to see a repeat of their 2000-2005 intifada, or revolt, which was spearheaded by gunmen and suicide bombers and met a crushing Israeli military response. "God forbid that we should come to a new intifada. The Palestinian people are not thinking about launching a new intifada," he told reporters during a visit to Argentina. "The Palestinian people are only thinking about the road toward peace and negotiations and no other path. We will not go back to an intifada because we have suffered too much". (Haaretz).Prime Minister Benjamin Netanyahu is considering seeking either cabinet or governmental approval for a ten-month freeze in West Bank settlement construction, in a bid to relaunch stalled Israeli-Palestinian peace talks. A senior official in Jerusalem said the move would include a commitment to a series of limitations and restrictions on settlement building, but would not halt construction in East Jerusalem. Israeli officials hope that the official declaration of a settlement freeze would enable the renewal of the negotiations with the Palestinian Authority, which has refused to engage in peace talks until Israel implements such a measure. Netanyahu has updated the Obama administration as to his position on the settlement freeze. The United States has demanded the move for a long time over the past year, and it was not immediately clear whether Washington has accepted Netanyahu's stance. (Ynet, API, Haaretz).The crisis in the relations between Turkey and Israel has ended, Turkish Foreign Minister Ahmet Davutoglu said Monday evening after meeting Israeli Industry, Trade, and Labor Minister Binyamin Ben-Eliezer in Ankara. "There has always been an open channel of communication between the countries, and therefore there is no need for a new beginning," said Davutoglu, "We are willing to resume our role as mediators between Israel and Syria." As for the Israeli-Palestinian conflict, the Turkish FM called on the sides to "launch a new era." The Turkish deputy prime minister, Bulent Arinc, said on Monday that Turkey-Israel relations must improve:"The diplomatic relations between the two countries have known ups and downs, but they must stabilize," said Arinc, adding that the ties must improve with regard to "every issue." Ben-Eliezer said in response that Israel and Turkey must remain strategic allies and that the Israeli people want the relations to continue. "The Israeli people want to return to good relations with Turkey," the minister said. He added that in was in the two countries' mutual interests to strengthen the relations. (Haaretz).A key aide to Prime Minister Benjamin Netanyahu, Uzi Arad, said on Monday that he hoped stalled Israeli-Palestinian peace negotiations would be renewed within the coming weeks. Arad, the National Security Council chairman, said Israel was not investing all of its efforts in relaunching peace talks with Syria because it did not wish to harm the chances of doing so with the Palestinians. "Preoccupation with the subject of Syria is likely to be interpreted as an attempt to flee from the Palestinian issue, which is not the case," Arad told the Knesset's Foreign Affairs and Defense Committee. "The Israeli policy today is to restart the Palestinian process; Israel is making efforts, some of which are coordinated with the United States, in order to renew it." Arad's comments came after President Shimon Peres said peace between Israel and the Palestinians was just a "step away," and urged the Netanyahu government to do everything necessary to ensure an end to the conflict during its tenure. "Today, there is just one step left between us and the end of this conflict," said Peres. "The current government can and must do it. The painful solution of dividing the land, two states for two peoples, was something the [Israel's first prime minister] David Ben-Gurion took on himself, and today it is accepted by the majority of the nation. The president spoke during a memorial ceremony marking 36 years since Ben Gurion's death, at Sde Boker in the Negev. (JPost).Only a leader of the Israeli Right can succeed in bringing peace with the Palestinians, Industry, Trade and Labor Minister Binyamin Ben-Eliezer (Labor) said over the weekend, in a revealing interview with the Ma'ariv newspaper. Ben-Eliezer said this despite being a former Labor Party leader who was close to former prime minister Yitzhak Rabin and is now a loyal ally of defense minister and current Labor chairman Ehud Barak. "In the current sociopolitical situation, only a leader from the Right could pass a peace process through the nation," Ben-Eliezer said. "[Former prime minister Menachem] Begin returned the Sinai. Could a Labor leader do that? Could a Labor leader have dared evacuate Gaza and destroy the settlements?" Ben-Eliezer said. "Rabin was killed just for Oslo. Does anyone think I could have evacuated Gaza? Only a leader from the Right could bring such a change. There is nothing we can do. That's the reality. Take it or leave it." Ben-Eliezer boasted in the interview that he had spent considerable time with Prime Minister Binyamin Netanyahu and made a serious impact on his policies. He suggested that Netanyahu could succeed in reaching a peace agreement where his predecessors had failed. "Bibi wants to advance the diplomatic process with the Palestinians more than any leader I know," Ben-Eliezer said. "Despite the pressure he faces, he makes an effort day and night to reach a breakthrough." But Ben-Eliezer said he still believed Labor had an important role to play in pushing the Right toward the diplomatic process from inside the government. He said he did not believe there would be a merger between Likud and parts of Labor. "Bibi and Barak broadcast the same language," Ben-Eliezer said. "They understand each other. They complete each other. And yet, I don't see Barak joining Bibi." 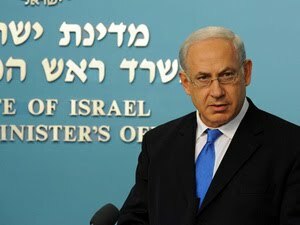 (Ynet).Prime Minister Benjamin Netanyahu refused to address recent reports indicating progress on a prisoner swap with Hamas that would see captive soldier Gilad Shalit returned to Israel, saying a deal with the Islamist group has yet to be finalized. During a Likud faction meeting on Monday, the PM said any prisoner exchange agreement would have to be approved by cabinet. "I cannot say yet whether a deal will in fact be struck. It is not only up to us. There is hesitancy on the part of the other side as well," he said. "It is still unclear what will happen – what will be offered and to what we will agree to." During the meeting, Netanyahu spoke of the dilemma Israel is facing. "On the one hand, we want to look after our soldiers and bring them back home - a value that our nation and Jewish tradition hold in the highest regard - but on the other hand we want to avoid future kidnappings." The Prime Minister's Office announced earlier that some of the recent reports regarding a prisoner exchange deal for Shalit's release "are not credible and some of them are even intentionally distorted." Recent days have seen a number of various reports of progress in talks for a deal, and following the meeting held between the soldier's parents and negotiator Hagai Hadas, Netanyahu's office wished to stress that most of the information being circulated is baseless and unconfirmed. "Many details coming from abroad and in foreign media are being published lately, but they are not credible and some of them are even intentionally distorted. Efforts to secure Gilad Shalit's release are continuously underway, out of the media's view, and we have no intentions of commenting beyond that," the Prime Minister's Office said in a statement. "Today, we will refer to International Day for the elimination of Violence Against Women, which occurs this Wednesday. I intend to visit a shelter for battered women. This is a very serious problem in Israel and around the world. Globally, it is estimated that one-third of women have suffered violence at least once in their lives. One study indicates that there are 150,000 battered women in Israel, a terrible number. However in 2008, a certain decline has been reported. This is thanks to the various organizations that are active, the Authority for the Advancement of the Status of Women, which I was fortunate enough to establish as Prime Minister, as well as the women's organizations, shelters and other active elements. But it is clear to us that much more needs to be done. Deputy Minister Gamliel will brief us on these issues. I would like to say something that I believe is very important: The most important thing is to hold to a policy of zero-tolerance for violence in general and for violence against women in particular. I think that while this will resonate in Israeli society, we still have a long way to go in instilling this awareness and in enacting specific plans; thus our meeting today and discussions later this week".